During the late 19th century, many chemists and entrepreneurs made their own toothpastes. 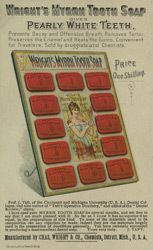 There were many varieties and competition was fierce, so advertising on leaflets such as this one was a way of ensuring that as many people as possible recognised your product. This American advertisement features an endorsement from Professor J Taft of the Cincinnati and Michigan University Dental Colleges: "I have used your MYRRH TOOTH SOAP for several months, and am free to say that I am much pleased with it. So far as I know it has no superior if an equal, in the preparations of this kind. To none of the materials used in its composition can any objection be made; indeed they are the materials largely used in the preparation of dentifrices generally. You have certainly succeeded in producing a most excellent dental soap."